Landscaping is a way to beautify your home by renovating and adding to the landscape---your yard. In many cases, landscaping may not extend past a simple flowerbed or garden. However, it is possible to create more elaborate landscapes using elements such as water. Waterfalls in particular are popular among individuals who enjoy the sounds and sight of water in their yard. Knowing how to lay rocks correctly when constructing a waterfall is vital to maintaining its structural integrity. Lay out pond liner on the bank where you intend to place the waterfall. The slope should have ledges built on it where you will place the rocks and have elevated edges to keep water from leaking out of the sides. Set the bottom spillway rock in place first. This is your largest flat rock and will stick out of the bank the farthest. Make sure it is secure on its own ledge since all the other waterfall rocks will rest on it. Place a small layer of staggered rocks on top of the bottom spillway rock. These are usually square rocks called support stones, and your middle spillway rock will rest on top of these, so ensure that you lay enough stones to give it proper support. Set the middle spillway rock on top of the support stones. This will be your second-largest flat rock. Set it so that the edge of the rock extends three to four inches past the support stones for a cascading effect. Position the top rock on the middle spillway rock. This rock is usually half the size of your middle spillway rock and square or rectangle in shape. The water will pour over this rock first, making it appear as though the rock is the source of the waterfall. Lay smaller rocks on top of the top rock to hide the water's source. These should be small rocks, no more than four inches in diameter. 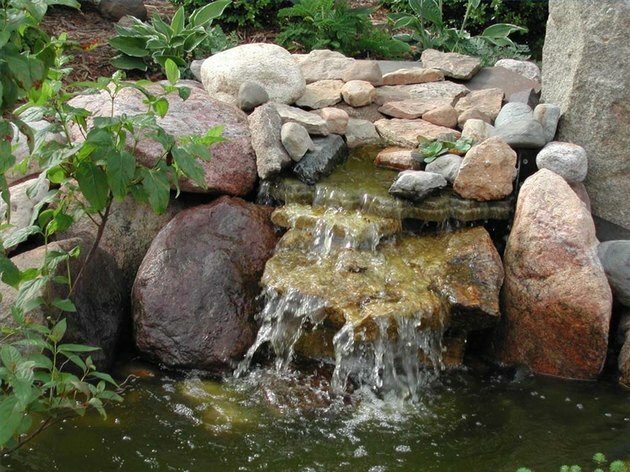 Decorate the elevated edges of the waterfall with rocks of your preference to hide the pond liner and other mechanical equipment. You can also cultivate shrubs and plants on these edges to give it a more natural appearance. Justin Chen is a freelance writer and photographer with 6 years of professional experience in outdoor activities, extreme sports, travel and marketing topics. His professional work experience includes publication with KOMO 4 News Seattle, Fisher Interactive Network, and Demand Studios. He is a current Pre-Med student at Walla Walla University.